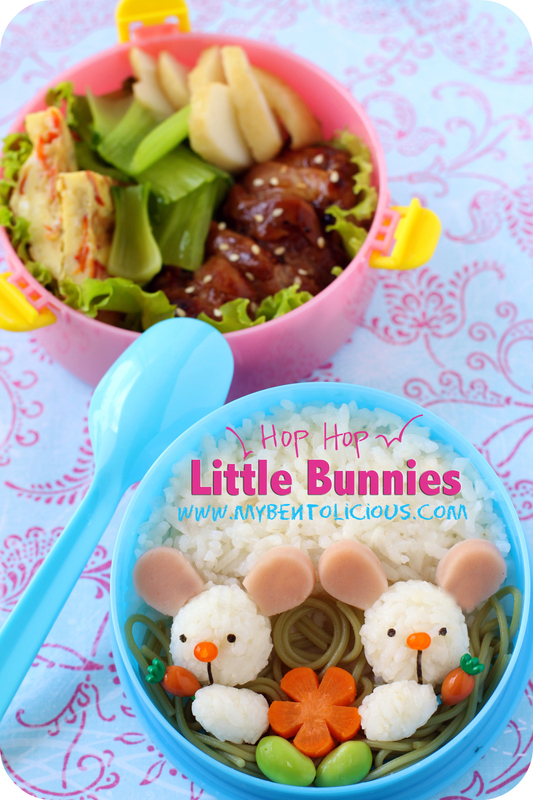 The two little bunnies for today's bento were made of rice, fish sausage, nori, and jelly balls. They held their carrots which actually food picks. After the last bento with ume somen, this time featured cha somen as the grass decorated with flower shaped carrot and edamame. I didn't make two hands for the bunny but I'm pretty happy with the result. All of you can be the judge whether this is working or not. I haven't started to make any Halloween theme bento yet. But hopefully I can get some ideas over the weekend and join the fun to make Halloween theme with other bento friends. Inside the pink box : chicken cooked in oyster sauce with kaffir lime & lemon grass - sprinkled with sesame seeds on the top, stir fried bok choy, fried fish cakes, and red paprika omelet. Wish all of you a wonderful weekend too! OMG, they are so cute! I love it. @shoppingmum : Thanks a lot Amy! Happy to hear your wonderful news, Lia! Have a great weekend!!! Owh... those lil bunnies are just too cute!! ... I have to check for the ume somen when I go to asian market next time, I never taste ume somen before. Would you mind to share some cooking tip? or the recipe maybe ... Thanks. Lia, the bunnies are soooo cute!!! You are amazing! Such cute bunnies and carrot picks, and love the carrot flower too. Have a great family weekend! Lucu mbak :D itu hidung kelinci-nya dari apa? Lovely bunnies, perfect carrot and so cute picks! How exciting to get hubs back!! ^_^ , have a great weekend you too Lia! Such a wonderful bento!! Hope the wonderful bento brings you wonderful weekend. happy wonderful weekend mba lia. Hopefully your husband return safely with lots of gifts from Korea. Thank you for jumping on my private blog at multiply. by the way what is an ume somen? @tatabonita : You always give me your sweet comment :) Thanks a lot Tata! how cute are the bunnies!! @mr. pineapple man : Thanks a lot for your kind comments! Aww they are adorable! They actually look fluffy..lol Are those carrot picks? Loving those! Such sweet happy bunnies...the chicken with oyster sauce and kaffir lime sounds like such a treat! Wishing you and family a weekend as beautiful as this bento, dear Lia! Thanks for making me smile. I think I like cute bunny bentos the best! @bentobird : Thanks a lot Jenn! Love to cook simple meals and that chicken was easy to cook :) Have a great weekend too for you! hihi..lovely bunnies. I love how they hold the food-pick carrots. @Hearty Bakes : Thanks a lot! @Kids Dream Work : The bunnies got flu hehehe ... Thanks a lot Ai Ping!